In this update I'm hoping to talk a little about making the experience of playing Audio Tree as diverse and modifiable as possible. Hello and welcome to Audio Tree's second update! In this update I'm hoping to talk a little about making the experience of playing Audio Tree as diverse and modifiable as possible. Basically it's just another developer ramble, hope you enjoy it. A shot of the startup menu. 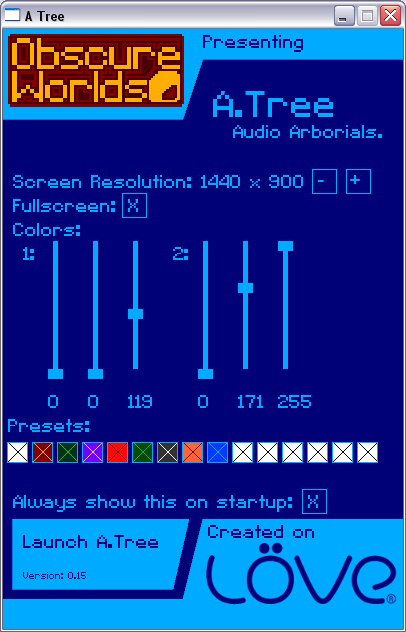 From this menu you can select your settings, resolution, create your own colour scheme to work with or use a preset one. Adding a way for users to modify the colours used by the game was the start of a train of thought; I should let users edit and modify as much of the game as possible, ideally even add a way for them to make their own content and share it with their friends. Soon after this idea, I started to work on a sandbox mode where it would be possible to create your own songs in the game and use them as levels. Also by simply sending the level file and the samples it used, you could share your song or level with a friend. Originally my plan was to use only samples in Audio Tree, but after building the sandbox area for a while, I realised that it was going to be really dull and boring finding new samples on the internet when someone didn't want to just use the default samples. before this more user friendly version. Why not just make it possible to make your own samples within the game, cutting out as much bull as possible (Only one file to send to share a song, no need to google for samples, everything in one place). So soon I started writing my own synthesizer called Drone, but after looking at the source code of vrld's MÖAN synthesizer, I realised I was writing pretty much exactly the same thing and contacted MÖAN's creator to get his permission to use it. Since then I've just been working on additions to the menus like the presets on the startup menu and the interface/menu that will allow you to interact with the synthesizer and create samples in sandbox mode. 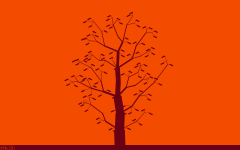 IS IT WORTH ME MAKING THE SHAPE OF THE LEAVES MODIFIABLE? This has been on my mind for a while because it could alter the look of trees quite alot, making the game even more customised, but I dont know whether people would actually use it or not. Also if you have a question for me just post it in the comments or on the frontpage and I'll answer it as soon as possible.